These household cornerstones are crawling with the germs you bring home with you. With flu season already upon us and upcoming winter nights staying in, you may want to consider giving your home an extra layer of protection it deserves. For environments where cleanliness is a concern, take the extra step to minimize the exposure of bacteria on your switches and wallplates. Bacteria can live and cultivate on these surfaces for months so keeping these devices clean can be an ongoing challenge. Leviton is bringing cleanliness to light with our line of Antimicrobial treated devices. This revolutionary solution works together with regular cleaning practices to help keep switches and wallplates cleaner for you and your family. Antimicrobial treated devices from Leviton are your home’s first line of defense when you walk through the door. This line of switches and wallplates contain an EPA registered antimicrobial additive that inhibits the spread and reproduction of bacteria and in turn, helps to keep the product surface cleaner. The material used to create our Antimicrobial treated devices has proven to inhibit 99.9% of harmful bacterial growth on the device’s surface, even after being cleaned with common cleaning products such as ammonia, isopropyl alcohol, hydrogen peroxide and bleach. The silver ion additives we embed inside the switch and wallplate material have natural antimicrobial properties while also resisting the development of mold, fungi and odor-causing bacteria. 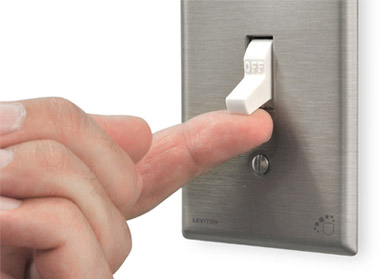 Your switches and wallplates are two of the most frequently touched surfaces daily, don’t leave their cleanliness up to chance. Consider installing Antimicrobial treated devices from Leviton anywhere in your home for an extra layer of protection and peace of mind against the season’s worst.